Click Here for our disclosure and Refresh for May Day #1, Day #2, and Day #3. Have you ever started using a product that has become so integral to your routine, you wonder how you survived so long without it? Well, for me, this is dry shampoo. As someone who frequently works for stretches longer than 24 hours, tries to squeeze exercise into a hectic schedule, and often attempting to work out in the gym at the hospital, this product is vital. 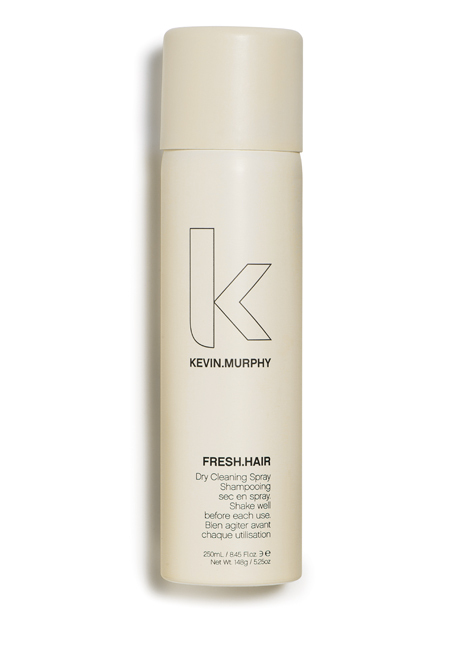 My favorite is Fresh.Hair by Kevin Murphy. This dry shampoo comes in a spray powder formulation literally saves my hair by keeping it hair fresh and clean, but without having to shampoo it multiple times a day. I have tried several, and this brand so far has been the best – a light, citrusy scent that doesn’t overpower, a fine enough mist that I am not left with any white residue, and it really works to absorb any work out or post-call-I’ve-been-up-for-30-hours grime. This entry was posted in Beauty, Hair and tagged best dry shampoo, dry shampoo, dry shampoo review, Kevin Murphy, Kevin Murphy dry shampoo, Kevin Murphy Fresh.Hair by surgeoninkicks. Bookmark the permalink.